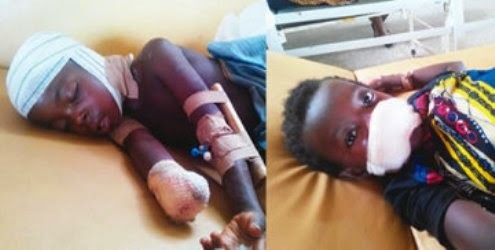 The Edo State Police Command has launched a manhunt for a man who hacked two children to death, severed the arm of another, while he also tore the nose of another child. The suspect, Mike Okeze, 50, was said to have stormed the home of his neighbour ─ Udeh Oliver ─ on Wednesday in Okha II community, off Old Sapele Road in the Ikpoba-Okha Local Government Area of Edo State. He allegedly attacked Udeh’s children with a machete and hacked two of them – Destiny Oliver, (3 years); and Samson Oliver, (6 years) – to death. Another of the children, Goodness Oliver, (4years), had her wrist severed, while eight-year-old Gift Oliver sustained a deep cut in her nose. The Edo State Police Command’s spokesman, Noble Uwoh, told our correspondent on the telephone that the police had launched a manhunt for the alleged killer and would soon apprehend him. He said, “The suspect murdered the two children in his neighbour’s apartment, following a misunderstanding between him and the Udehs. “The man actually had a misunderstanding with the wife and the man went to her house and murdered a six-year-old boy and another three-year-old boy. “The same suspect went ahead to inflict injuries on two other children of that woman who are currently undergoing treatment, while two corpses have been deposited in the mortuary. “The injured ones are Gift Oliver, eight years, and Goodness Oliver, four years. The father of the children, Udeh, however urged the Edo State Government and the Nigeria Police to fish out the suspected killer and made him face the law. Udeh, who hails from Enugu, told our correspondent that his wife, Chinyere Udeh, was Okeze’s initial target. He added that the wife ran away to get help from neighbours when the assailant descended on the children. He said, “The man attacked four of my children with a cutlass. Two died, while the remaining two are at the University of Benin Teaching Hospital. I have six children. My other two boys and my wife escaped from the man. The corpses of the two who died are at the Stella Obasanjo Hospital, Benin. The mourning father claimed that the suspect had nurtured hatred for his family. He said, “I didn’t have any problem with him. But my wife told me that he hated my children. So, when I travelled, he attacked my family with a cutlass and killed two of my children,” he said. The 30-year-old, who manages a farm for a living, lamented that he could not afford to pay the hospital bills of his two daughters, who had both been scheduled to undergo a surgery at the UBTH. “I was told that two of my children, who were injured by the man, would have to undergo some operations. I know that the cost of the operations will be expensive and I don’t have any money. I only manage a farm to feed my family. “I am appealing to the government and the police to help me fish out my family’s attacker wherever he is and get to the bottom of the case,” Udeh said.